Editor's Note: This is part one of a series on the history of Cossacks defending Pochaev Lavra in Western Ukraine. Read part two here. Cossacks are basically Russian Vikings. They are a semi-democratic military people, who elect a Hetman - a warlord - to lead them, and are known for their unshakable courage in battle, and unwavering defense of the Orthodox faith. Cossacks launched many Viking-like raids and even assaulted the shores of Ottoman-ruled Constantinople, infuriating the Sultan in the 16th century. Reply of the Zaporozhian Cossacks to the Turkish Sultan by Repin was the most valuable Russian painting in history. Notice the colors of the pikes on the top left, they reflect the color of the Ukrainian Flag, and the George Ribbon which is now banned in Ukraine by the fascists as being anti-Ukrainian. History disagrees. When the Sultan, the most powerful man in the world, demanded that they stop, their response was a letter filled with profanity and mockery. "You will not make Slaves of Christian Sons!" they said to him. And indeed, when his Tatar forces laid siege to the Lavra, the Cossacks came to defend it, though it's widely believed that a miraculous and terrifying omen from the Lavra's icon saved the day. Now, in modern divided Ukraine, the fight is again raging. One of the places Cossacks have always protected unto death is the Pochaev Lavra, a monastery in Western Ukraine that has historically been a stronghold of Orthodoxy, its mighty walls a bulwark of the Russian Faith throughout the ages. For that, it has endured endless attacks and trials. A Cossack standing guard over Pochaev. Between the 16th-19th centuries, the greatest threat to the Lavra was the Union of Brest. This union was a Catholic church coup encouraged by, if not outright created, by the Polish nobility to divide and conquer their Ukrainian territories. Poland was ruled by an elected Monarch and a Senate, where every nobleman was considered equal, and even rebellion against the crown was legal. In practice, the country was often ruled by families of powerful Magnates with more influence than the crown itself. In Ukraine, these Magnates brutally persecuted the Cossacks. They forcibly converted many churches to Vatican control; Cossacks who died for Poland in wars were put in stocks in peacetime. Moved by the suffering of his people, Hetman Bogdan Khmelnitsky, the Greatest Cossack of all time, staged a rebellion against Poland. 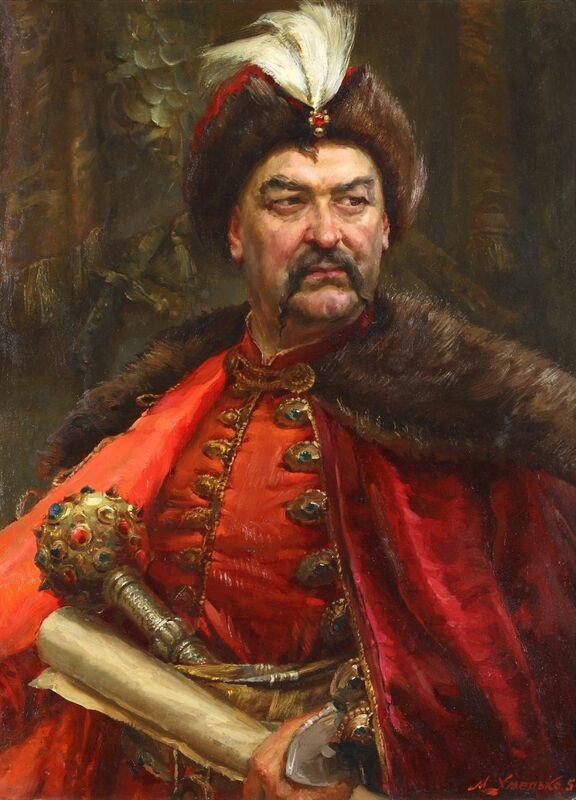 In those days, the Bogdan Khmelnitsky lead his uprising against the Poles, to defend the Golden Liberties (Polish-Lithuanian system of political freedoms afforded to every noble) of the Cossacks and the Orthodox Church. Just as Dmitri Donskoi came for the blessing of Saint Sergius of Radonezh, Bogdan Khmelnitsky came to the Lavra for the blessing of Saint Job. After obtaining Saint Job’s blessing, and many hard battles, his uprising was finally successful. He not only defeated the Poles with the help of Czar Alexis of Russia, but he did the unthinkable: he reunited Ukraine with Russia for the first time since when the Mongols violently separated them in 1240. The Reunification of Ukraine with Russia at the Pereyaslav Rada, Bogdan stands center left, atop the stairs in red. Bogdan Zinovii Khmelnitsky is the Ukrainian George Washington. He is one of the few figures in the country revered by all sides from Russian Nationalists to Ukrainian fascists, from clergy to atheists. He is regarded as the liberator of Ukraine, and an entire province of the country is named after him. He was the Hetman, or elected Warlord of the Cossacks when they were ruled by the Polish-Lithuanian Commonwealth.